Unlike most trucks, you order at the driver's-side window, and collect at the back. 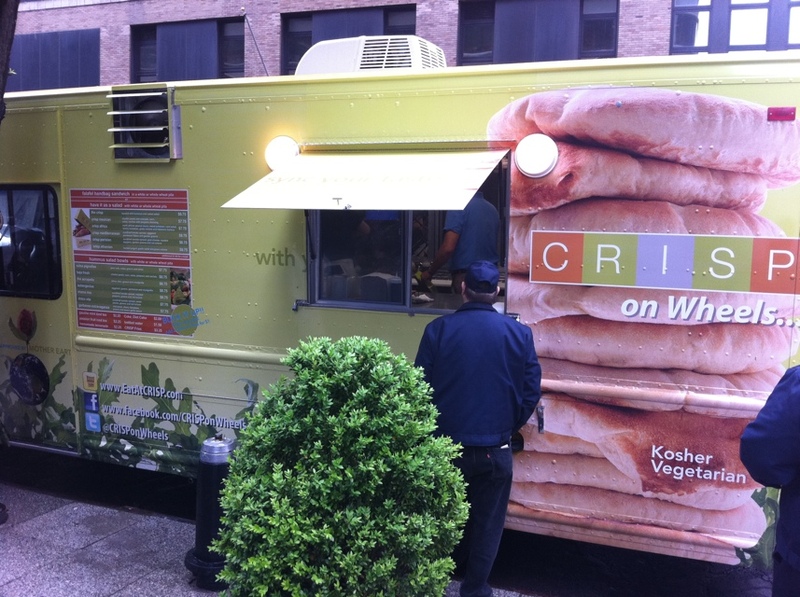 Crisp is a small chain of, well, artisinal falafel joints in NYC with a trio of locations. I’d never been to one. But like many other vendors, they’ve got a truck out on the streets now, and I felt the urge to try it. There's a falafel in that elaborate box. Crisp isn’t particularly cheap. It cost a total of $10.26 for my “Parisian” falafel (more on that shortly) and a side of fries. Granted, the fries were just $1, but nonetheless, when you consider that you can get Mamoun’s for so much less (and how tasty it is), Crisp had better dazzle. The elaborate 'handbag.' Rather clever, really. One thing that might be driving the price of their falafel up is their elaborate packaging, which they dub “the handbag.” Actually, it is fairly awesome, if somewhat wasteful. It has a zip-pull in the middle of it which essentially decapitates the box, revealing the falafel within. This gives you something quite convenient (and not messy!) to hold onto as you begin devouring the sandwich. Nonetheless, it’s an elaborate piece of tech for a falafel. A couple of quick notes: they seemed to still be working out some kinks at the truck. When someone else snitched my fries from the man at the counter, he gave me a $2.25 “Gaucho mint tea” for free to apologize for the delay. I’m glad he did, it was very tasty. It comes unsweetened, though he offered a plastic tube of syrup to add to it. I’m pretty sure, though, that I wouldn’t pay $2.25 for the smallish cup of the stuff, but it was pleasant. 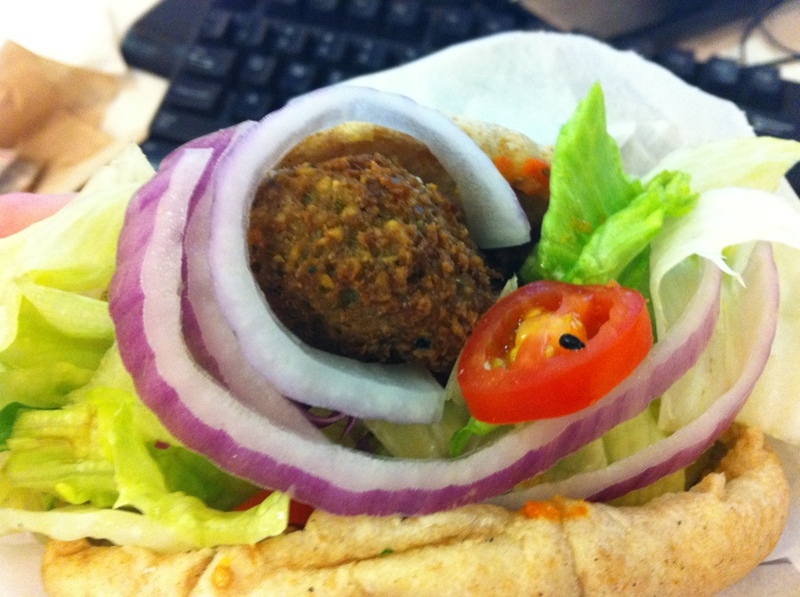 Anyway, back to the falafel. As I mentioned, Crisp offers what I call “artisinal” falafel, meaning that they try to twist the falafel concept around and add a variety of different ingredients, spreads and flavors. For example, they offer a Mexican take (cilantro pesto, avocado, corn, salsa, nachos and jalapeno dressing), an African (peanut sauce, sweet potatoes, corn salad, cherry tomatoes, onions, habanero harissa sauce) among others. 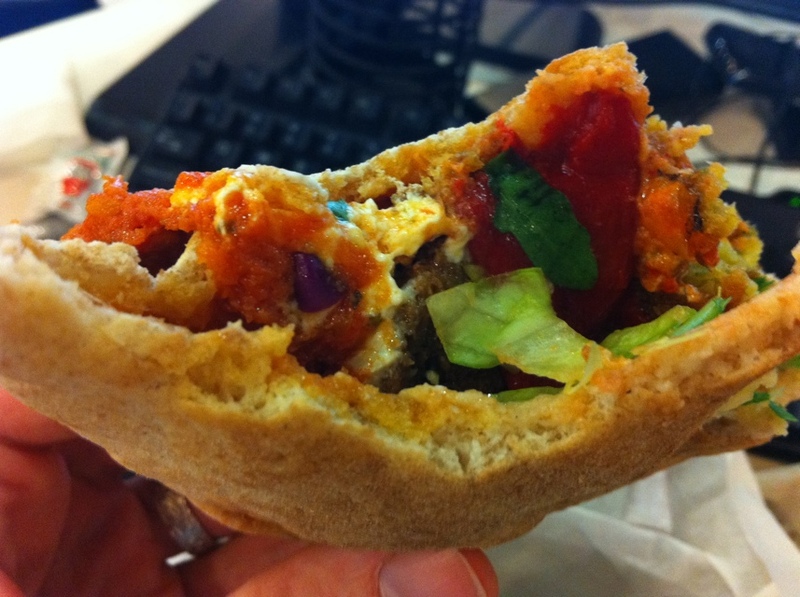 I chose the Parisian, which included sundried tomato spread, goat cheese, roasted peppers, greens and onions. The fresh salad fixings really stood out. Far and away, this is the freshest and, well, most crisp salad components I’ve had in a falafel. Usually they are wilted and look a bit rough around the edges. Not so at Crisp, where I think their name is especially apropos. I was delighted with the quality and quantity of lettuce, cherry tomato and onions in the sandwich. The fries, which was certainly a good portion for just $1, were lightly fried and tasty. It wasn’t clear I need them, since the falafel itself is a significant portion. If there’s a trouble with the Crisp falafel, it is not the ingredients. The problem (elaborate packaging notwithstanding) is the construction. My Parisian falafel, with goat cheese and sundried tomato spread, tasted just like any other falafel I’d had (albeit with fresher vegetables than most) until I got to the bottom. You see, whoever had constructed the sandwich had put the goat cheese and sundried tomato spread in first, in a dollop. Everything else sat on top of it. If they had taken one second more to spread these things along the interior walls of the pita, the entire sandwich would’ve been infused with their delicious flavor. Instead, they were reduced to a delicious desert-like concoction. 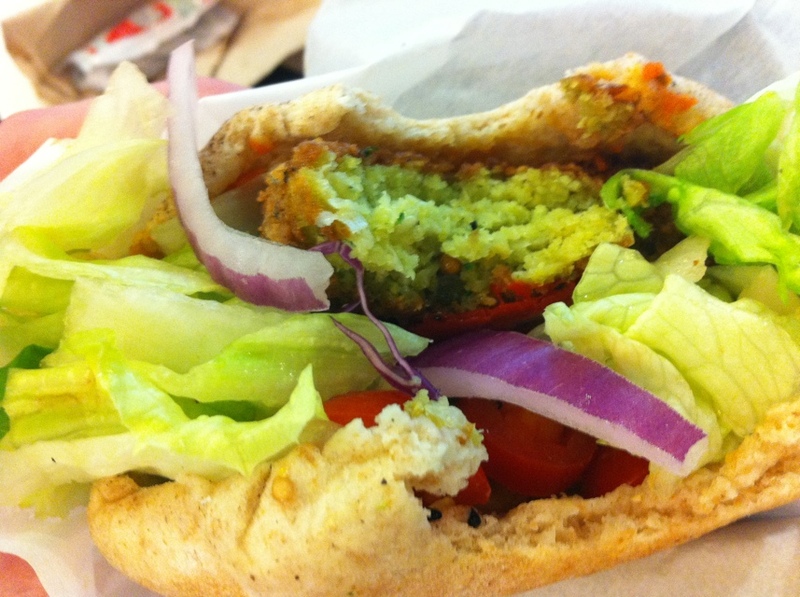 Look, it’s a pricey falafel – the Parisian was $8.75 on its own, a standard falafel is $6.75. Mamoun’s is cheaper and excellent, Taim is still the reining, defending champ in terms of overall succulence and quality. 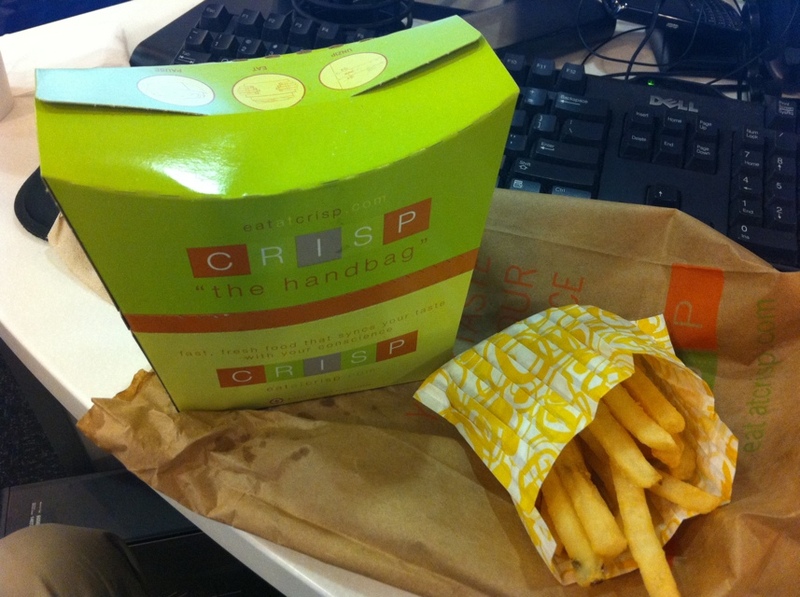 But Crisp offers an excellent contender, and a worthy challenge in its own right. I’ll go again, when I’m flush. Thanks for the review of our truck and the praises of our flavors! We really appreciate it. As far the construction of the sandwich, we apologize if it wasn’t up to the Crisp standards. This had actually been a problem on the assembly line and we have someone new building the Crisp handbags now so they are up to the standards of what a customer deserves. As you can tell, I well enjoyed the sandwich. I think you guys offer a very fresh and delicious product. If the folks are now smearing the various sauces around the inside of the pita before adding the remains of the ingredients, there’s no reason I can think why it wouldn’t be a total win. I’m looking forward to trying it again.